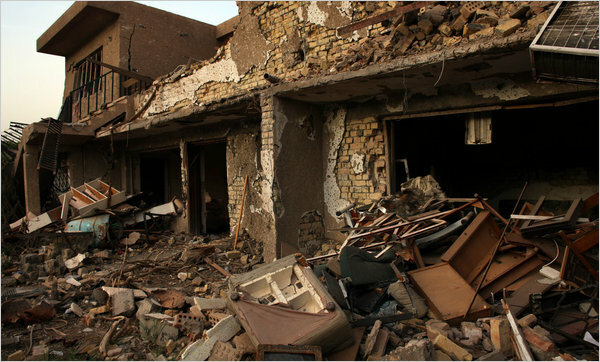 Jabra Ibrahim Jabra’s Baghdad Home Destroyed; The End of an Era? The Baghdad home of great Palestinian writer Jabra Ibrahim Jabra—who settled in Iraq following the nakba—was destroyed by a car bomb last month. A relative of Jabra’s entrusted with the home and son were both killed; countless papers, books, and paintings from the Iraqi and greater Arab art world were also ruined or destroyed. The NYTimes article about the event and its aftermath, which ran yesterday, is at times depressingly, at times irritatingly sweeping. The article is suffused with lyrical nostalgia: Jabra’s legacy of beauty and art has been destroyed. An era (in Iraq, or in the Arab world) is over. “We’re in an era when cultures habitually and even deliberately misunderstand each other,” Mr. Allen said. …he disagreed with the notion that the house was the atlal, the ruins, of a bygone era. “Too pessimistic,” he said, adding that Mr. Jabra was never pessimistic. Read a piece by him that ran in Al Ahram in 2003, a year before his death: Mystery in Mesopotamia. Order In Search of Walid Masoud from Amazon.Com, or buy it at your local indie bookstore. And then order Princesses’ Street, translated by his friend Issa Boullata. Thank you for the reflection on the NY Times article and the the web links. While I too found the article uneasily pitched between the ridiculousness of a too formulaic storyline and genuine sense of the tragic, I still had to pause to consider it in greater depth. I had also been interested in the subtle, ironic, and psychological notion of “deliberate misunderstanding” and didn’t connect it with a sense of fatalism as you seem to have. We must also bear in mind that Prof. Allen has gone out of his way not only to translate Jabra Ibrahim Jabra, but also to make (recent and contemporary) Arabic literature known and available. For example his 1973 co-translation of Mahfouz’ God’s World was the very translation that was cited and brought to the attention of the Nobel Committee. I would cite Allen’s own web page, http://philae.sas.upenn.edu/~rallen/ one source of his contributions to ‘Arabic Literature (in English). While you mention this nostalgia as part of the tenor of Anthony Shahdid’s article, I don’t think you should let someone like Allen get swept into your concern. You might indeed look as some of the pictures on his website of author’s he has been connected with. That said, I stopped to make this comment in part because of the comment that ‘Jabra’s widow and son’ were also killed in the explosion. This was not mentioned in the NYTimes account which had said the house had been turned over to a relative. So 2 questions. Was the house intentionally targeted, and given the number of people killed, at a time when it was an obvious gathering place. And secondly, and more importantly, was this widow the “beautiful Lamica” mentioned in Jabra’s famous memoir, “Princesses’ Street: Baghdad Memories”? If so, then this bombing would be even more poignant and unhappy. I mean no disrespect to Roger Allen, who has translated a large number of great literary works, taught Arabic lit for many years, and surely struggled in many ways to assist Arab literary artists. I believe this was his beloved wife, yes. I have been out of the loop in a number of ways, and this story makes a crappy Monday that much worse. I knew Jabra was long since gone, but I had not heard this about his family. I am disgusted. For a long time, I was obsessed with Abdel Rahman Munif. Munif was very good friends with Jabra, and I believed they co-authored a novel. This co-authorship was part of an interesting duo of very innovative authors, and I assert they are some of the best authors no one has ever heard of. I have never really read Jabra, but I tried to at one point (my ability to read lit in Arabic wains from time to time). The fact that he was close friends with Munif was enough for me, especially since I read their criticism and their philosophies were very interesting to me. The true irony here, since I do not know much about Jabra beyond his prolific translation and notable original lit, and this post reminds me he was a pretty big art collector, was his close friend Munif was actively opposed to the invasion of Iraq, right up until his death. I am glad that they did not live to see this, because it would be a testament to everything they were against (especially Munif, who left politics to go to literature since he felt the latter had a greater impact on social change after becoming a disillusioned ex-Ba3thii thanks to Saddam and the newer generation kind of missing the point of the original platform they subscribed to). All I can think at this point is: does art imitate life or life imitate art. While writing this, I am thinking of one book I read that is vaguely related: الأشجار واغتيال مرزوق. The connection is not obvious, but the idea of an intellectual essentially choking to death in colonial Iraq seems somewhat fitting here. Sorry to depress you/spread my depression. Munif, Abdul Rahman & Jabra Ibrahim Jabra. 1982. عالم بلا خرائط, Beirut: al-Muassasa al-Arabiyya lid-Dirasat wan-Nashr. I thought it was in English as A World Without Maps, but now I don’t see it. Yes, it’s miserable. Between that and reading Banipal 37: Iraqi Writers, I am almost overwhelmed. Hello. I thought I would leave a comment here, first because I am travelling to Iraq today with a copy of Jabra’s Hunters in a Narrow Street and second because I am researching a history of Baghdad (for Penguin publishers) and am seeking contributions from Baghdadis. Memories of the city, stories, family tales, from the twentieth century and earlier right up to the present. I wonder if you could recommend anywhere online that I might connect with Baghdadis? Many thanks. It was not his widowed wife who we lost there in the destruction, it was a relative, and her son. Jabra Ibrahim Jabra was my grandfather, and the woman we lost, an aunt. Jabra lived until ’94, and witnessed the first invasion of Iraq. However, for a love of his people, he refused to leave his dying country as we departed in ’91.